During a a joint venture project of Australian, French, and Japanese researchers scientists found that there were twice as many Adélie penguins as originally thought. They observed a 5000km long coastal stretch in the East Antarctic. Instead of the expected 3.6 million birds they observed almost 6 million Adélie penguins in the study area. 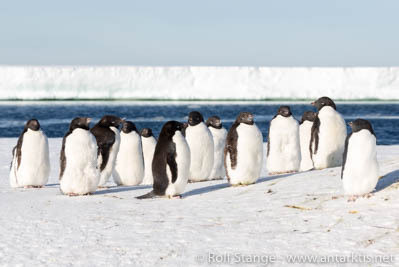 This would lead to an overall estimate of 14-16 million Adelie penguins world-wide. This has, amongst others, implications on antarctic krill and other fisheries, as such a great number of penguins eats about 200,000t krill and 19,000t fish during one breeding season in the East Antarctic alone. The data were determined over several years by means of satellite technology, individual tagging and automatic camera monitoring. Adélie penguins in the Ross Sea.